GBM is a highly popular prediction model among data scientists or as top Kaggler Owen Zhang describes it: "My confession: I (over)use GBM. When in doubt, use GBM." GradientBoostingClassifier from sklearn is a popular and user friendly application of Gradient Boosting in Python (another nice and even faster tool is xgboost). Apart from setting up the feature space and fitting the model, parameter tuning is a crucial task in finding the model with the highest predictive power. The code provides an example on how to tune parameters in a gradient boosting model for classification. I use a spam email dataset from the HP Lab to predict if an email is spam. The dataset contains 4601 email items, of which 1813 items were identified as spam. For a formal discussion of Gradient Boosting see here and the papers mentioned in the article. The tuning process is based on recommendations by Owen Zhang as well as suggestions on Analytics Vidhya. The descriptive statistics below give a first idea on which features are correlated with spam emails. 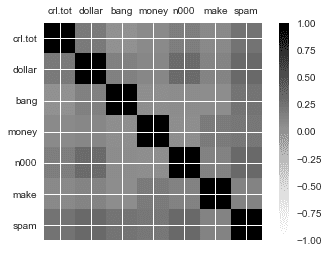 Everything related to money (dollar, money, n000) is strongly correlated with spam. Spammers use more words in capitals and the word "make" as well as exclamation points more frequently. Split dataset into train and test set. I use the following baseline scikit-learn library settings. The plot displays the importance of the feature: The number of words in capital and bang seem to have the highest predictive power. With this first model, we obtain a rate of 0.90 of true positives (positive meaning spam) and 0.87 true negatives and an accuracy of 0.88. Many strategies exist on how to tune parameters. See for example this blog post on Machine Learning Mastery for some guidance from academic papers. Most data scientist see number of trees, tree depth and the learning rate as most crucial parameters. Hence, we will start off with these three and then move to other tree-specific parameters and the subsamples. I will use 5-fold cross validation and evaluate models based on accuracy. You may also consider to evaluate the model based on a different measure such as roc_auc. n_estimators captures the number of trees that we add to the model. A high number of trees can be computationally expensive. Generally, with a change in learning rate,n_estimators should also be adjusted (10-fold decrease in learning_rate should go in line with a approx. 10-fold increase in n_estimators. max_depth bounds the maximum depth of the tree. We can use the obtained results to tune the max_depth parameter. There is one interesting comment on depth in the scikit-learn documentation especially relevant for large datasets: "We found that max_leaf_nodes=k gives comparable results to max_depth=k-1 but is significantly faster to train at the expense of a slightly higher training error." The model's performance did improve with the tuning. The "true positive" and the "true negative" rate improved. Interestingly, there was also a slight change in the ranking of feature importance with the interaction of bang and crl_tot now ranked first. min_samples_split sets the minimum number of samples to split while min_samples_leaf sets the minimum number of samples to form a leaf (Notice the slight difference). The square root of features is usually a good starting point. Let's use CV to tune the parameter. The tuning suggests to use 4 features (close to the sqrt of 21). Subsample sets the fraction of samples to be used for fitting the individual base learners. Values lower than 1 generally lead to a reduction of variance and an increase in bias. The final model performs slightly worse than the model after the first stage of parameter tuning if applied to the test set. The difference is, however, very small. Comparing the area under the curve, the three models only slightly differ. Model 1 performs best best on the AUC measure for the test dataset.